Axss brand XS series Ethylene Oxide Gas Sterilizers are fully automatic devices that sterilize, either resistant to heat or not, any kind of plastic, rubber, sensitive, metal, mechanic or electromechanic medical, surgical materials and laboratory equipment by applying the anti-bacteriologic agent, Ethylene Oxide at 54 °C.Axss offers a new technology gas (kit based) sterilization system. 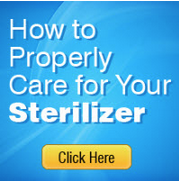 Sterilization is achieved using heat generated by the sterilizer. Sterilization and Aeration in same cabinet. Modular, ability to add sterilization bags. 100% Ethylene Oxide Gas Cartridge of 20 gr.